Texas Democratic Senate candidate Beto O'Rourke's 1998 arrest for driving under the influence has been public knowledge, but police reports show it was a more serious threat to public safety than previously reported. O'Rourke, a congressman representing the state's 16th Congressional District, has acknowledged and apologized for the incident throughout his time in politics. 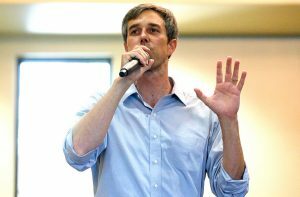 "I drove drunk and was arrested for a DWI in 1998," O’Rourke said on Thursday. "As I've publicly discussed over the last 20 years, I made a serious mistake for which there is no excuse." Earlier in the week, the congressman wrote an op-ed on criminal justice reform in which he referred to the arrest as a "serious mistake for which there is no excuse." State and local police reports obtained by the Houston Chronicle, however, indicate just how dangerous O'Rourke's actions were. The reports reveal two details previously overlooked: there was a crash involved and a witness said O’Rourke attempted to flee. On Sept. 27, 1998 at 3 a.m., O'Rourke was driving on I-10 in the town of Anthony, Texas, when he hit a truck and his car was sent across the median and into oncoming lanes of traffic. A witness said he was driving at "a high rate of speed" for the 75 mph zone when he lost control and that he attempted to flee the scene. Police said O'Rourke was visibly intoxicated when they stopped him, saying he was slurring his speech, had glossy eyes, smelled of alcohol and nearly fell down after getting out of his car, according to the reports. O'Rourke claimed he was driving a drunk friend home, but police said there wasn't anyone in the car with him. O'Rourke was tested on two police breathalyzers, blowing a .136 and .134. The state's legal limit at the time was .10; it has since been reduced to .08. O'Rourke was also arrested in the past for jumping a fence at the University of Texas-El Paso. Neither arrest, while acknowledged by the Texas Democrat, has "factored significantly into O’Rourke’s political career," according to the Houston Chronicle. O’Rourke has long characterized the incidents as youthful indiscretions in which he showed "poor judgement." To some extent, he has sought to leverage them to advantage. After a recent tour of the Harris County Jail with Sheriff Ed Gonzalez, O’Rourke cited his own scrapes with the law as part of a plea for criminal justice reform. "Those mistakes did not ultimately define me or stop me from what I wanted to do in my life or how I wanted to contribute to the success of my family and my community," he wrote in the op-ed piece, which was published Monday.